At the turn of the century Boston was alive with the arts. The Museum of Fine Arts, Jordan Hall, Symphony Hall, Chickering Hall and the Boston Opera House were all built within the space of ten years. All of these endeavors were led by prominent Boston families. The finest prominent Boston families. The finest private collections of art existed in Boston, exemplified by the collection in 'Mrs. Jack's' home, now known as the Isabella Stewart Gardner Museum. Many of these families, as well as providing financial support for various organizations and collecting art, befriended the artists, musicians, and composers themselves. Mrs. Gardner provided much support for the Boston Symphony as well as for composer/violinist Charles Martin Loeffler and pianist/composer Ferruccio Busoni. In later years the Dr. Augustus Thorndike family befriended a young composer named Walter Piston, whose oboe suite was dedicated to Thorndike, an amateur oboist. The events which led to Elise Hall's interest in and contribution to the arts developed in a most interesting way. Some time after her marriage to Richard John Hall, a prominent surgeon of New York and Santa Barbara, Mrs. Hall began suffering from a loss of hearing. Her husband told her that if she wished to retain what hearing she had she would have to play a wind instrument to blow out the tubes in her ears. The family then went looking through the small town of Santa Barbara for such an instrument and could only find a laborer who played the saxophone. Mrs. Hall began to study with this man. In 1897 Mrs. Hall's husband died in very unfortunate circumstances. Richard Hall was the founder of Cottage Hospital in Santa Barbara and had become one of the most beloved men in that city. While suffering abdominal pains, Dr. Hall diagnosed appendicitis in himself (appendicitis had first been described in 1985) and an operation was performed. It was discovered that Dr. Hall had typhoid fever, not appendicitis. He died five days later. Thereupon Mrs. Hall took her two daughters (and her saxophone) back to Boston where the rest of her family lived. Mrs. Hall began renewing relationships with old friends. Many of these old friends were doctors with whom Mrs. Hall could speak on a very educated level, having been married to a surgeon. A great number of these friends were music loving amateurs who would meet once or twice a week in each others' homes and play chamber and orchestral music. Dr. and Mrs. Augustus Thorndike had many of these informal concerts at their home, a large doublehouse on Commonwealth Avenue. Much of the activity was centered around Beacon Street where J.C. Munro, Elise Hall and Isabella Gardner were all neighbors. Dr. Munro played the viola and Mrs. Hall, of course, played the saxophone. After a number of months some members of the group began to grow more serious and wished to perform for others. A committee was formed and they began to search for a professional conductor for their group. In 1898 Georges Longy came to Boston as the principle oboe of the Boston Symphony. Longy was a kind, charitable man who was to become one of the most admired citizens of Boston. Longy was experienced as a conductor, having re-established "La Societe de Musique de Chamber pour Instruments a Vent' in 1895 in Paris. For Thorndike, the oboist, and Mrs. Hall, a life-long Francophile (although from a very old and prominent Boston family, Mrs. Hall, had been born in Paris and had attended schools there as a young woman), Longy was the perfect choice. Monsieur Longy was approved and became conductor. Georges Longy gave the group direction. He coached all of the players and gave them insight into works by modern French composers and others that had never been heard in the United States. Indeed, the first American performance of Debussy's Prelude to the Afternoon of a Faun was given by this dedicated group of amateurs. They called themselves the Orchestral Group of Boston. 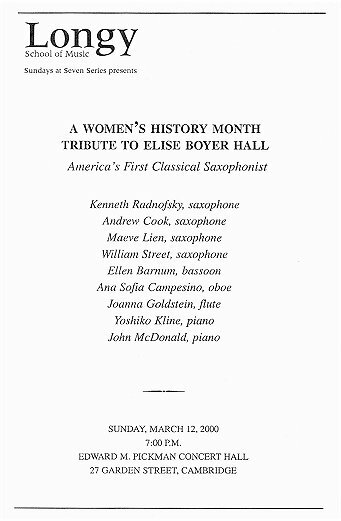 At the inception of the club in 1990 one may see Elise Hall's name on the bottom front cover of the program as a member of the musical committee. By 1902 she was chairman of the musical committee. And, by 1904 she had become the chief financial backer, president and business manager of the club. The format of the cover was changed to include the names of only Georges Longy and Mrs. Hall. Mrs. Richard Hall was supporting the entire Orchestral Club venture with tireless enthusiasm and she was having the time of her life playing the saxophone. She and Longy became very close friends and she coached regularly with Monsieur Longy. Her career, which had begun and the age of forty-seven continued for twenty-two years. Whatever talent Mrs. Hall had was cultivated by her life-long friendship with Longy. Even on years when Longy returned to France for the summer, Mrs. Hall took a chalet next to his in Piccardy. Three she had a lesson every day. Longy suggested names of composers to write pieces for Mrs. Hall, many of whom were his close friends. They included Jean Hure, Claude Debussy, Vincent d'Indy, Henri Woollett and Andre Caplet. Virtually every concert Mrs. Hall played included the premiere of at least one new work for saxophone and orchestra. Works by French composers were being heard in the musically provincial city of Boston and the literature for saxophone was beginning to take shape. The musical provinciality of Boston was more evident in the Boston Symphony Orchestra programs. The predominant music heard in Boston was German. Georges Longy had come to Boston as one of the first Frenchmen in a virtually all German orchestra led by Karl Muck. For seventeen years Georges Longy and Elise Hall tried to develop in Bostonians a more cosmopolitan public appreciation of music. Works by Enesco, Faure, Moussorgsky, Mozart, Reger and Ravel were heard in Boston for the first time. Their concerts here were hailed by Philip Hale, one of the finest critics of the time. But the public was still slow to accept French music for so-called musical reasons. There was a final catalyst which launched Boston and its major musical organization, the Boston Symphony Orchestra, into a more worldly acceptance of French music, and for that matter, all music. All of Mrs. Hall's and Monsieur Longy's work brought French music to Boston to stay with the unwanted help of World War I. Less than a year after Congress declared war the conductor of the Boston Symphony, Karl Muck, was arrested for pro-German activities (many believe unjustly) based on his reluctance to play the Star Spangled Banner before concerts and supposed secret activities. In his place came Henri Rabaud from the Paris Conservatory. Rabaud's Chansons Russes were played on the first program of the Orchestral Club in 1900. Rabaud stayed for only a year, and Pierre Monteux was appointed music director in 1919, remaining until 1925. Many different works began to be heard with more French, Italian, Russian and American players gradually joining the orchestra. In 1924 Elise Hall died. In 1925 Georges Longy retired from the Boston Symphony and returned to France after twenty-seven years as principal oboe. He founded one of America's first professional wind groups (the Longy Club), and had founded a school of music to teach the French method of sight-singing. Both of the projects had been financially supported by Mrs. Hall. Elise Hall had become America's first classical saxophonist and had commissioned works for her instrument while producing concerts and supporting the growth of music in Boston at the beginning of the twentieth century. At a farewell concert given in Georges Longy's honor at the Longy School of Music in 1925 the Rapsodie for Saxophone which he wrote for Mrs. Hall was plated one last time. A grand musical era in Boston had come to a close. Eric Sawyer, George Crumb, and Mark-Anthony Turnage. 2 nd half are Boston composers of this era.